Cattle have been raised in this area, in ancient times as well as today. 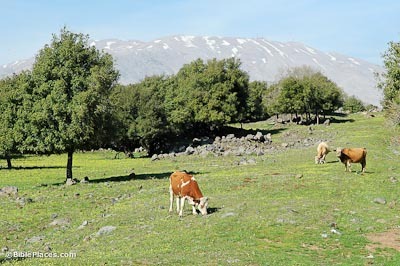 Both beef and dairy cattle are currently raised in the Golan Heights. In biblical times, this area (known as Bashan) was known for its cattle and its oak trees. Amos 4:1-2 (NASB) “Hear this word, you cows of Bashan…” (cf. Ps 22:12). Zechariah 11:2 (KJV) “Howl, fir tree; for the cedar is fallen; because the mighty are spoiled: howl, O ye oaks of Bashan; for the forest of the vintage is come down” (cf. Isa 2:13). 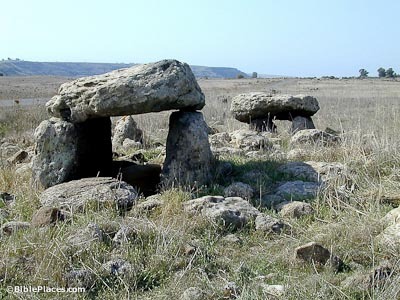 Hundreds of dolmens have been found in the Golan Heights. Used for burial in the basalt areas where grave digging is difficult, dolmens were used for burial during both the Early Bronze I and Intermediate Bronze periods. The dolmen was most likely intended as a burial chamber for the chief of a clan, or another member of the nomadic elite. A dolmen is constructed of two large vertical stone slabs capped by a horizontal stone, which can weigh up to 30 tons. Known in Arabic as Subebe (from the Crusader name L’Asibebe), this English name for the castle mistakenly associates it with Nimrod, an ancient figure of great strength mentioned in Genesis 10:8-9. This is one of the castles that was built by the Muslims, but it changed hands several times in the 12th century. The fortress was strengthened in the 13th century and most remains visible today are from that period. The mountain is over 400 m (1,300 ft) long, and in places its width reaches 150 m (490 ft). The summit rises to an elevation of 800 m (2,600 ft) above sea level. The castle is also known as the Citadel of the Mosquitoes since swarms tend to rise up at times and cover the entire area. The Golan Heights belonged to the country of Syria until 1967. During the Six Day War, Israel took this high ground overlooking the Huleh Basin and Sea of Galilee. Today evidence of Syrian habitation, including military bases and mosques (right) lie in ruins throughout the area. The region is now populated by Druze (who there before the war) and Israelis who have moved in since the war. Syria insists on the return of the Golan Heights as part of any peace agreement. 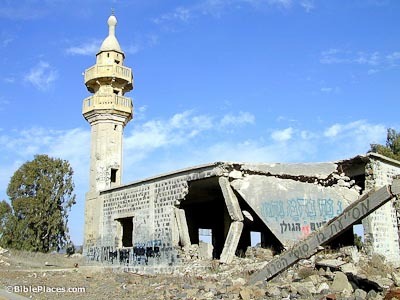 Rogem Hiri (in Arabic, Rujm al-Hiri) is located in the Golan Heights about 10 miles (16 km) east of the Sea of Galilee. 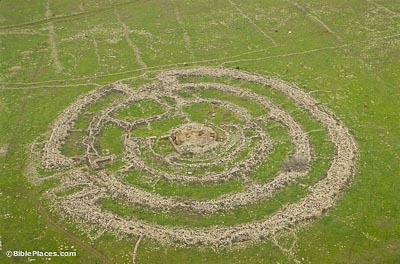 Four concentric circles surround a central cairn. The largest circle measures 150 m (490 ft) in diameter. The walls measure up to 3.5 m (11.5 ft) in width and have been preserved up to 2.5 m (8 ft) high. Its last use was no later than the Late Bronze Age (1500-1200 B.C.). The function of Rogem Hiri is not known. Suggestions include that it was a defensive complex, a burial complex, an astronomical observation center, or the tomb of Og, giant king of Bashan (Deut 3:11). The Golan is a basalt plateau which rises in the northeast to an average altitude of 900 m (3,000 ft) above sea level. The Golan Heights is bordered by Mt. Hermon on the north and the Yarmuk River on the south. At the northeastern corner is an inactive chain of volcanic cones. Their activities in the past created thick basalt layers, resulting in rocky terrain unsuitable for intensive agriculture. Instead, it is used mainly for grazing and pasture. 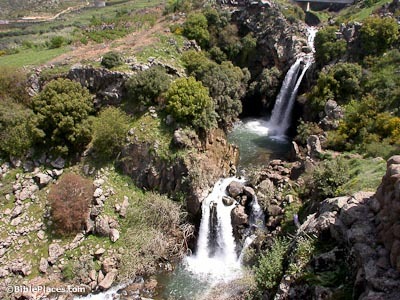 The situation of the Golan Heights results in a significant amount of winter rainfall, with large run-off in the spring through numerous wadis draining to the Huleh Basin and the Sea of Galilee. Mount Hermon is the southern tip of the anti-Lebanon mountain range. The highest peak of Mount Hermon is 9,230 ft. The highest point inside Israel’s borders today is Mizpe Shelagim, the “snow observatory,” at 7,295 ft. In the Bible it is known as Ba’al Hermon, Sirion, and Sion. Psalm 133 gives an image of the pleasantness and fruitfulness of this mountain. It speaks of the bounty of water, a place that receives much precipitation. Hermon, on average, gets 60 inches of precipitation a year (in 1992 it received 100 in). It is quite possible that the Transfiguration took place somewhere on the slopes of Mount Hermon, as Jesus and his disciples were previously noted to be in the “region of Caesarea Philippi.” Caesarea Philippi sits at the base of Mount Hermon and thus Mount Hermon could be the mountain where Jesus took the disciples. 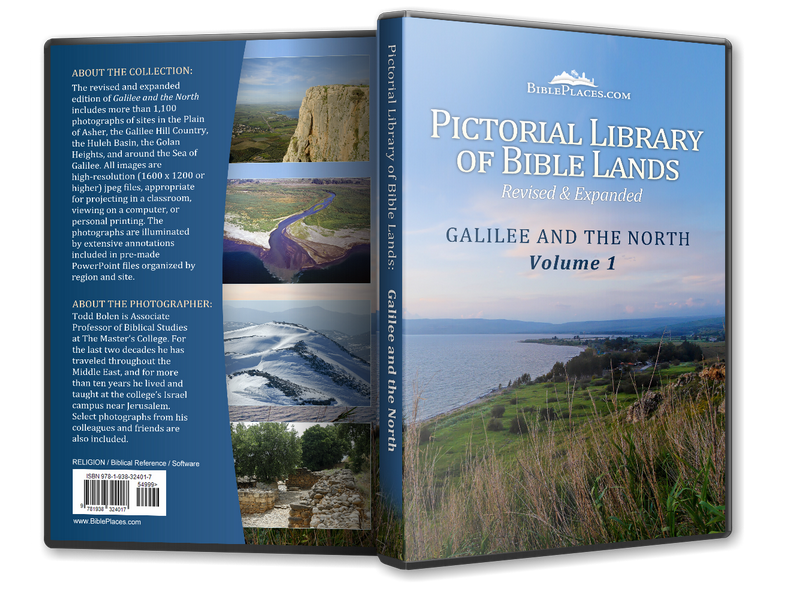 The Golan Heights (Jewish Virtual Library) Describes the region’s geology, geography, and history, including the events of the last century and the situation today. This site also offers a map of the region here. UNDOF (United Nations) Provides information about the United Nations Disengagement Observer Force that maintains the area of separation between Israel and Syria. 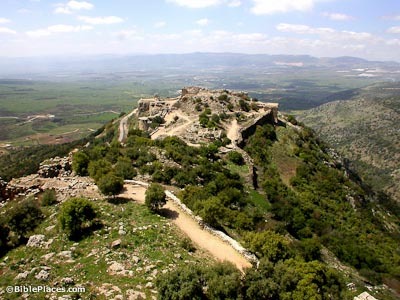 Nimrod Fortress National Park (Israel Nature & National Parks Protection Authority) Gives general information on the site, including some of its history and tips on visiting. The Nimrod Fortress (Jewish Virtual Library) A detailed description of the fortress and its history. Nimrod Fortress (Jewish Mag) A set of photographs highlighting various aspects of the fortress. Hippos Excavation Project Official site of the Hippos-Sussita excavation. Provides information about the excavation and some excavation reports. Also contains a picture gallery located here. Hippos (Sussita) 2003 Photo Gallery (The Bible and Interpretation) Displays pictures and plans from the Hippos excavations. This website also offers excavation reports on these excavations. The most recent one is located here.